Buzz Bee Toys came out swinging last year with a number of great items; the Thermal Hunter, the Zenith, and the Thermal Sensor were standouts for me. The Monorail was a good idea but it had some reliability issues when I tried it and that kept it off my favorites list. There were other blasters that had Overall though, the creation of Precision Darts, Long Distance Darts, and sucker darts was some great stuff that came out of Buzz Bee last year. This year, Buzz Bee seems to have gone the other way. 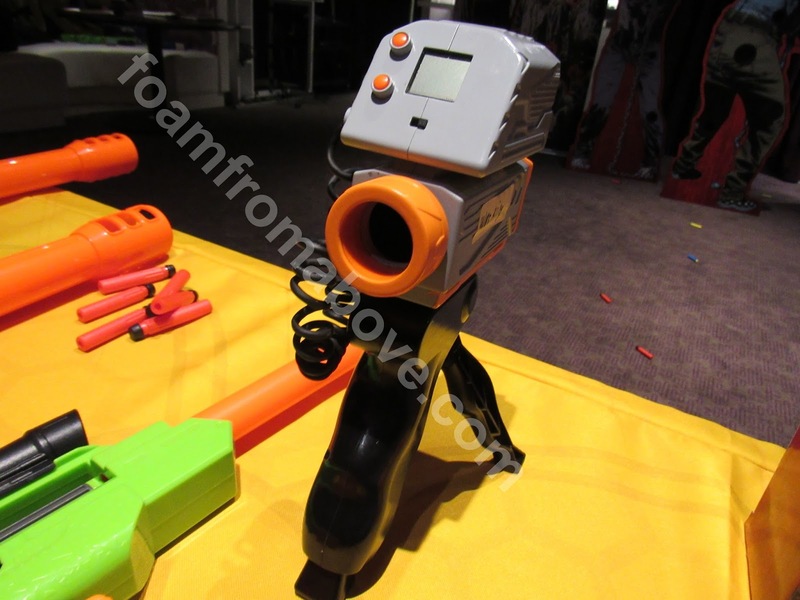 I saw a lot of bolt-action style blasters in their room, such as a new Snipe and their walkie-talkie blasters. Most telling though is that their headlining item, the Mutator – is going to be bolt-action. I can’t blame them either, the tactile feedback from sliding a bolt handle into firing is pretty cool, and plays heavily into the roleplay aspect of the blaster. 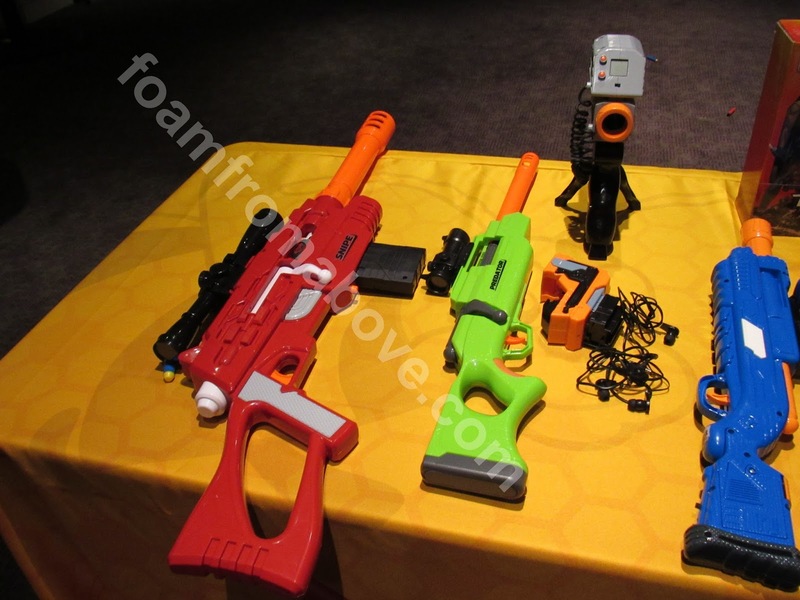 There are some exceptions, such as the new Demolisher for The Walking Dead line of blasters, and the PowerMech 20, but otherwise the majority of the blasters I saw on display were either out or bolt-action. 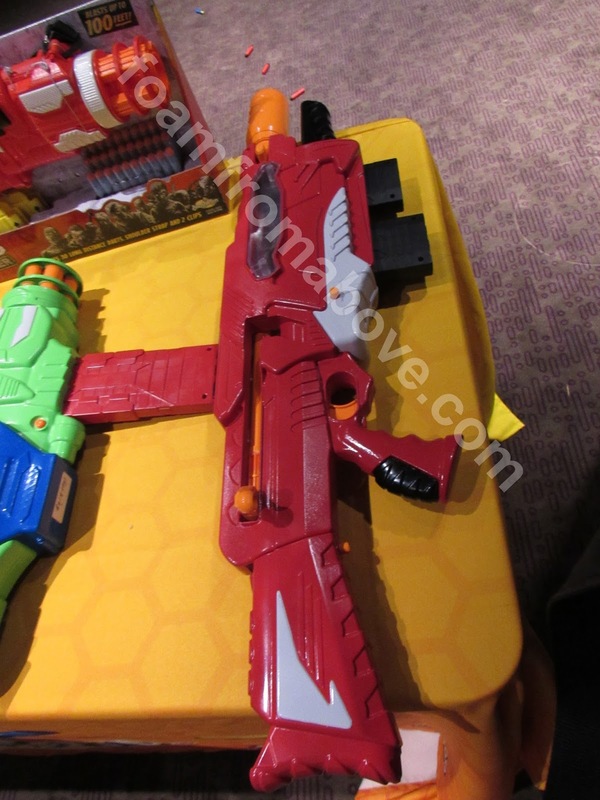 Interesting how that works out given Nerf continuing to use flywheels, pump-action, or the traditional pullback slide. The Mutator gets its name from the quick change it can pull off in the middle of a blaster fight. There are two magazines because you can load each one with a different type of ammo. One magazine is loaded with the precision darts, and the other loaded with the long distance ammo for farther targets. Pull the barrel forward on The Mutator to shift between either ammo type, bolt-action, and fire. The prototype was still very early, so I didn’t fire it but I did carry it a bit and manipulate the barrel. Interested to see the final product, for sure. What I like about the Mutator is it’s a big show-me blaster and the reloading without needing to pop a magazine out and slap a new one in is a time-saving and efficient idea. I believe I heard a few more tweaks are needed and the blaster may not be out til 2019 to make sure it’s firing on all cylinders. I hope that’s not the case and we’ll see it sooner, to figure out more tricks to do with a blaster that reloads as the Mutator does. The Covert Squad blasters were single-shot bolt action blasters, but the walkie-talkie action is a nice little twist. The blasters are compact enough to not be a bulky unit to hold up, and it’s just a neat gimmick feature for a simple blaster. 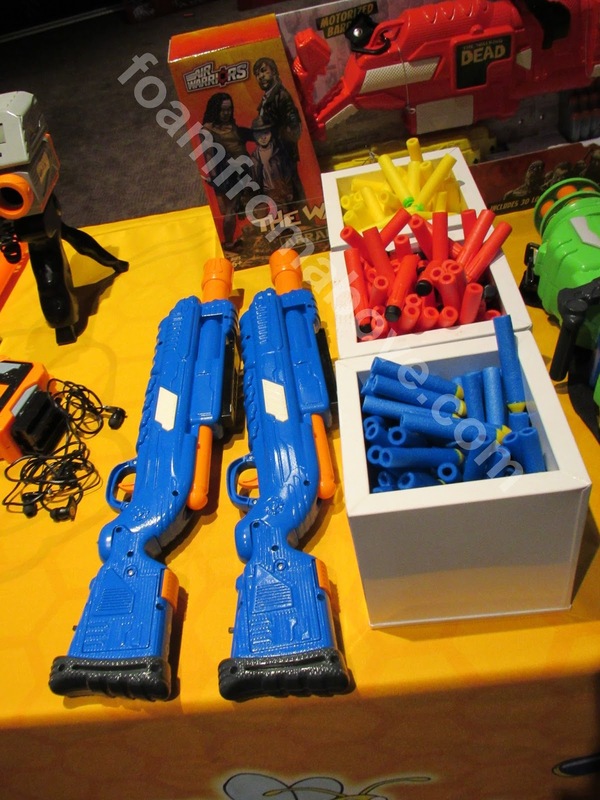 If you remember the old Nerf Commlink, this is similar but a much greater range (300′), much more streamlined form, earbud connection, and more streamlined unit. For $24.99 (in a two-pack) I’ll go ahead and put this on my Gift Ideas list for the holidays. The Demolisher was a flywheel unit, and then the PowerMech 20, but the real gem of the room was the Velocity X chronograph. The big notes on the Velocity X are that it’s a chronograph, AND accommodates Nerf Rival and Mega ammo as well. The unit could be held in hand against the muzzle, or set up to stand on its own via tripod, but this will have a home with maybe arena owners and general users. One concern so far is if the device will be able to read higher (modded) velocities, but I don’t think anyone’s tried yet. All the same, a really good idea. I got a few readings off it, and it was easy enough to use, but it’s a prototype as far as I’m concerned so when I see the production model I’ll chip in my 2 cents for a full, honest review. What was really cool was the range estimates; it would give distance estimates at an angle vs parallel to the ground. While the Nerf chronobarrel attaches to the barrel of the blaster and functions as an ammo counter, the distance reading, ammo diversity, and price ($14.99 MSRP!) get the edge here for Buzz Bee. At this stage in the game it’s too early in my opinion to really give my own review about anything, the Monorail was hyped last year but changed quite a bit before production. The Demolisher was a bit wonky from what I heard, so I didn’t really give that a try either, as prototypes tend to be. Prototypes from Toy Fair (if they work at all) may get altered en route to release. And that’s what could happen here. What we see at release may even be better, but you never can be sure. Is it great to know these things are coming out, however? You bet! Buzz Bee had their thermal sensor packaged separately now and their own version of a red dot sight. That means more accessories for your tactical rails, and with the Buzz Bee adapter these will work on your Nerf blasters too, if you need to change things up on your loadout. New light-up swords that attach at the handle (think Darth Maul’s double-sided lightsaber) are coming out as well, but I didn’t notice anything like Michonne’s sword. Still, if you run games with melee weapons the Buzz Bee swords are not only some of the most budget friendly items out there but also pretty durable for the cost. There were some other items that I think were not released for full info yet (though I think they made it out of Nuremburg, if you search the right videos you may see them) so there will still be a few different releases past the press release. I think I can say though, just keep an eye out for these items in Walmart’s “Adventure Force” line. Overall though, the Buzz Bee showroom showed that Buzz Bee continues to work their own place in the community with continued power increases and innovations from the brand. The Walking Dead license (for the comic, not the show!) and some different gimmicks and tech are on the way, which is a huge step for them to build on last year’s showing. Interestingly enough, they haven’t gone the Rival compatible route, opting to stick with the foam dart category and focusing on making some sweet blasters for dart users. The Demolisher’s aesthetic isn’t a Prometheus but I got a kick out of getting a feel for a gatling-styled blaster (Captain Xavier’s mod notwithstanding!) Definitely looking forward to more, and can’t wait to see the full form of the Mutator at release. Big thanks to Buzz Bee for having me, and see you on the shelves later this year.